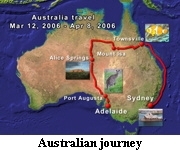 A good travel presentation (travel film, photo show of a journey, Internet presentation of a journey) very often includes a map or a map animation showing the destinations and routes. MapCreator has been designed to produce such maps or resp. map animations of a high quality in the simplest way possible. When travel maps are being produced the same difficulties always crop up. None of the maps available meets all the requirements. Often the map extract and the map size are not suitable, or the graphic quality of the map is inadequate. 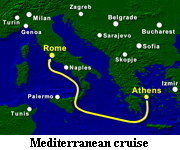 In addition the map is overloaded with too much information, so that destinations and routes are submerged amongst the multitude of places and roads marked. The symbol and labelling of places are often too small and then in addition if you wish to publish the map, you also have a legal problem, since a lot of maps may not be copied. The software MapCreator solves these problems. It gives the user the possibility of producing a map or resp. a map animation which matches requirements exactly. MapCreator does not contain a collection of maps but a map generator. All map elements (map extract, map size, land and sea, towns, inland water, borders, …) can thus be adjusted independently of each other. A high priority has been given to the graphic representation quality of the map. The map should look as perfect as possible. An important point when creating travel maps is the representation of the towns. They are usually the main focus of the journey. Only those towns important for the journey should be shown on the map. The symbol and the labelling of the towns should be large enough that they can be recognized immediately. Perhaps some individual towns are to be given particular emphasis. The labelling must be movable so that there is no undesired overlapping with other, non-movable map objects (e.g. 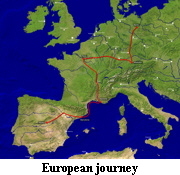 the travel route). In MapCreator, therefore, you can choose exactly which towns should be visible and which should not be visible. Town symbols and town labels can be individually adjusted for each town. Style, size, colour and 3D effects are freely adjustable. The labels can be moved as required. In addition to the towns and routes, other map objects (symbols, texts and pictures) can be added. Thus e.g. at a place of special interest a symbol can be inserted. Next to the symbol a label or perhaps a picture of the object of interest can be added. Style, size, colour, transparency and 3D effects can be assigned to all map objects. Publishing the maps and map animations created with MapCreator does not present a problem. They can be used in presentations without further enquiries. You will find out more about this under map licenses. People wishing to produce travel presentations are normally not cartographers but feel confident in the area of graphics and video software. The operation of MapCreator has thus been set up with graphic and video software in mind.